Aftab Ahmad Blog From slum to crorepati. Can he become an MP? From slum to crorepati. Can he become an MP? Unusual candidates are taking the political plunge this polls. If ABN Amro's country head has thrown her hat in the political ring in Mumbai, then a self-made young entrepreneur, whose rags-to-riches story has inspired a million souls, has joined the electoral fray in Chennai. E Sarathbabu thinks he can deliver. Because all his life, he proved what he can do. From a slum in Madipakkam in Chennai, where his mother sold idlis to educate him, he is the proud owner of Rs 70 million Foodking, a catering service that has five branches across the country. From the slum, he went to BITS, Pilani to study engineering and then joined the most prestigious management institute in India, IIM-Ahmedabad. After passing out of IIM-A, he declined offers of many MNCs to start his own enterprise. His motto: provide job to as many people as possible and eradicate poverty. "I know what hunger is. I have experienced it. So, I want to empower people by providing them jobs," he said, after he started his business. Having empowered some with his catering units, now he sets his eyes on empowering the nation by deciding to contest in the Lok Sabha polls. 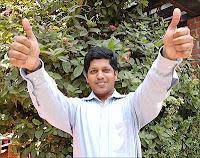 Sarathbabu is an Independent candidate from the prestigious South Chennai constituency.